CAMBRIDGE, UK, January 13, 2014 (ENS) – More than 3,300 ivory pieces and nearly 50 raw ivory elephant tusks were found openly for sale in the Myanmar (Burmese) town of Mong La on the Chinese border, according to undercover investigators from the Cambridge-based wildlife trade monitoring network TRAFFIC and Oxford Brookes University. “Our observations suggest Mong La may be one of the biggest unregulated ivory markets in Asia, and it is doubtless one of those where ivory is most openly displayed,” said Professor Vincent Nijman from Oxford Brookes University. The investigators say this discovery puts Mong La in the same class as markets in Bangkok, Thailand and Guangzhou, China, both recognized as illegal ivory trading centers. The discovery comes just a few days after China publicly destroyed more than six tonnes of ivory in Guangdong, in a display of commitment against the global illicit trade in ivory. The majority of inhabitants in Mong La, including ivory vendors, are from China, and the currency of daily use is the Chinese yuan renminbi. The town is visited by large numbers of Chinese nationals, mainly for the seedy nightlife. Sources who declined to be identified said ivory enters the town from China, mostly already carved. 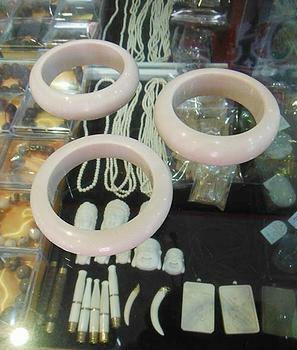 Twenty-seven shops in Mong La were found offering ivory for sale, most of it likely to have originated from Africa, where the carved hippo teeth also on display undoubtedly originated. Several shops were openly showcasing hundreds of carved pieces of ivory in glass display cases. Trade in ivory is illegal in Burma, also called Myanmar, and cross-border trade of ivory is not permitted under guidelines agreed upon by countries that are signatory to the Convention on International Trade in Endangered Species, CITES. “It is clear that neither Myanmar nor China are effectively enforcing CITES regulations, as ivory is evidently moving across the border,” said Nijman. Volumes of ivory found in the markets of Mong La were higher than at any point since TRAFFIC first started monitoring wildlife trade in the border town in 2006. “Increasing volumes of ivory in an open cross-border market catering to Chinese consumers is a sure sign that international agreements are not being enforced and action to reduce ivory demand is not effective,” said Dr. Chris Shepherd, director of TRAFFIC in Southeast Asia. “However, as the market is situated in Myanmar, it is the responsibility of Myanmar’s authorities to take swift action and close down this illicit trade,” Shepherd said. In 2014 Myanmar is chair of the ASEAN Wildlife Enforcement Network, ASEAN-WEN, a regional inter-agency and inter-governmental initiative to counter the illegal cross-border trade in endangered plants and animals. Myanmar is one of three countries in Asia, alongside Lao PDR and Cambodia, who have never submitted information on ivory seizures to the Elephant Trade Information System, the database on global ivory seizures that TRAFFIC manages on behalf of CITES Conference of the Parties.